AMPS can help you get new life out of your existing messaging system, while providing more capacity and functionality. A shock absorber is a buffer between two systems. It protects each system from the other and helps both systems to run smoothly. 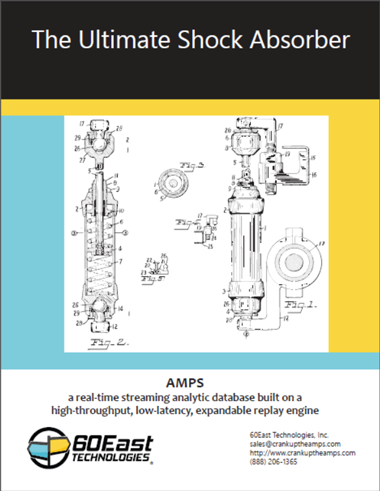 AMPS provides stunning throughput, expressive filtering, high availability, slow consumer protection, and unlimited record-and-replay of messages. All of these capabilities are necessary for a shock absorber. The whitepaper describes what makes a good shock absorber, presents how the capabilities of AMPS can be used as a shock absorber, and shows the kind of performance results that 60East gets when testing customer scenarios that use AMPS as a shock absorber.